Bulb planting time is almost here. The evening temperatures need to be in the range of 40-50 degrees which is not quite the case yet. Although the general rule of thumb is to plant 6 weeks before the first frost date, which for this area is about October 15, given the warm weather we've been having I would say bulbs can go in through the month of October. Stores are carrying bulbs now. Check your local garden center or the garden centers at Lowes or Home Depot. If you're looking for a specialty bulb or a different mix, try a company online like Color Blends at colorblends.com. The warmth of the soil will promote new root growth and establishment before the first hard freeze. You'll definitely want to water your bulbs this year because the ground is so dry from the drought we've been having all summer. Remember the depth at which you plant the bulbs and make sure the water soaks all the way down to that level. For spring flowering bulbs (daffodils, tulips, hyacinths, etc.) plant them 2-3 times as deep as the bulb is tall. If you want to fertilize the bed do it in the spring, as soon as shoots break through the soil surface. Do not fertilize after they start flowering, because that boosts bulb rot and can sometimes shorten the life of the flower. Bulbs like an acid soil with a pH in the range of 6-7. If you are not certain of your soil pH, we'd be happy to do a soil test for you. If you have a deer problem, avoid tulips, because deer love them! Good choices for deer resistant bulbs are Allium, Daffodils, Chionodoxa, Crocus, Iris, Scilla and Clochicum. Your planting location will influence when the spring bulbs come up; if you plant with southern exposure or on a hill, they will come up earlier than if planted in a valley where cooler air will settle. 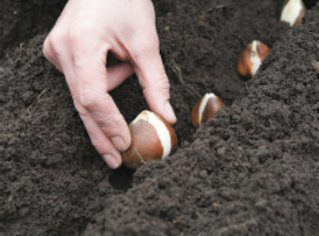 Bulbs are easy and great fun to plant for kids of all ages - Enjoy!